Auto. 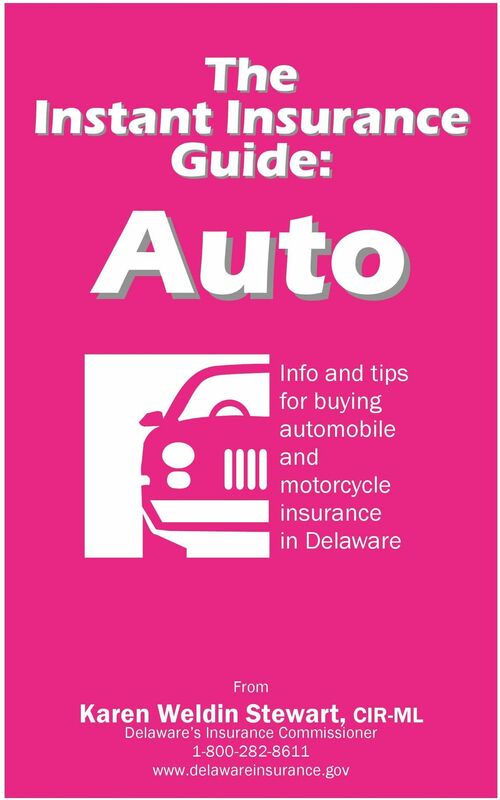 The Instant Insurance Guide: Info and tips for buying automobile and motorcycle insurance in Delaware. Download "Auto. 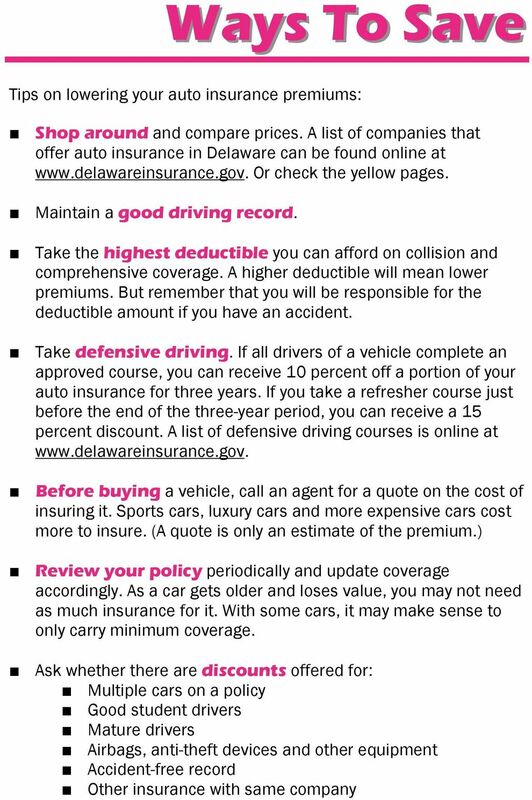 The Instant Insurance Guide: Info and tips for buying automobile and motorcycle insurance in Delaware. www.delawareinsurance." 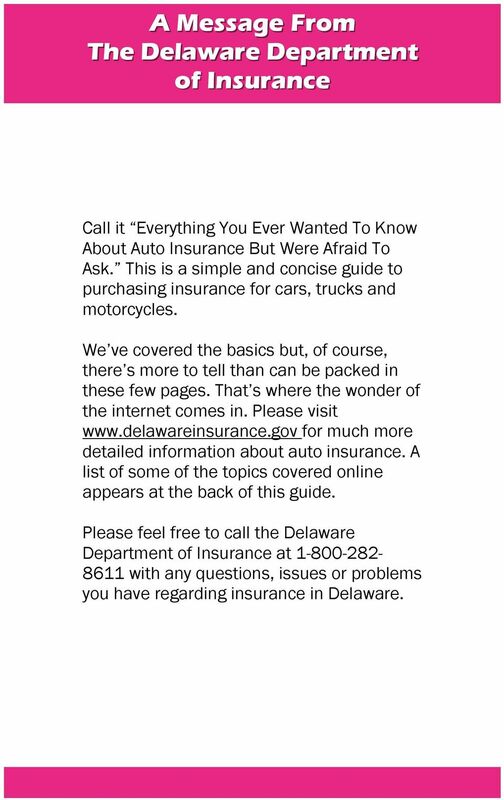 2 A Message From The Delaware Department of Insurance Call it Everything You Ever Wanted To Know About Auto Insurance But Were Afraid To Ask. 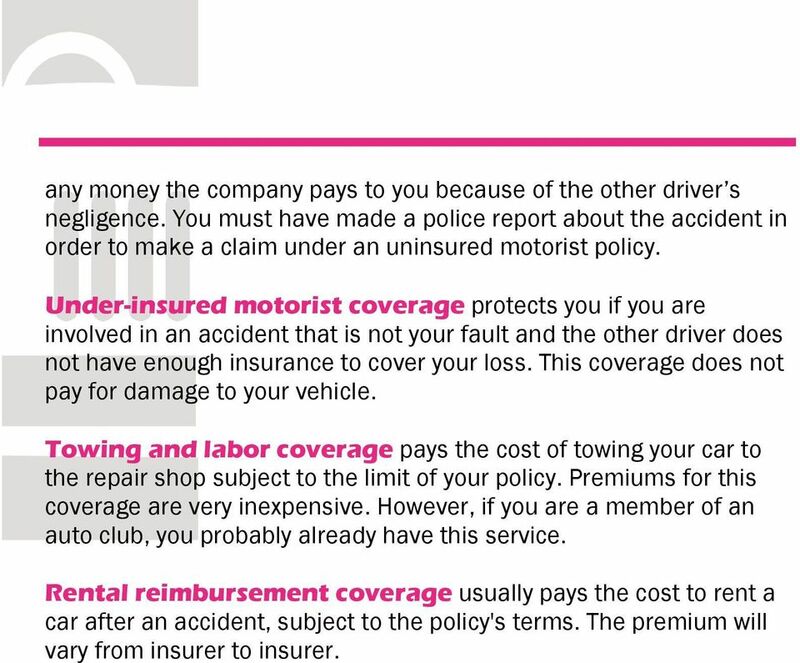 This is a simple and concise guide to purchasing insurance for cars, trucks and motorcycles. We ve covered the basics but, of course, there s more to tell than can be packed in these few pages. That s where the wonder of the internet comes in. Please visit for much more detailed information about auto insurance. A list of some of the topics covered online appears at the back of this guide. 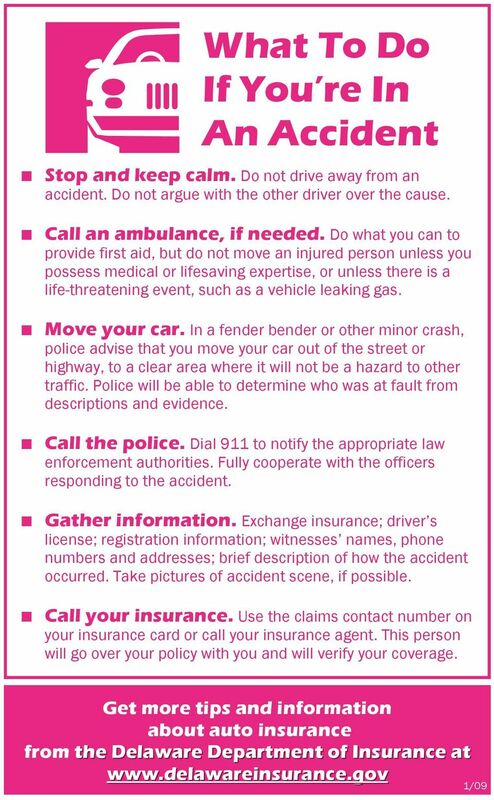 Please feel free to call the Delaware Department of Insurance at with any questions, issues or problems you have regarding insurance in Delaware. 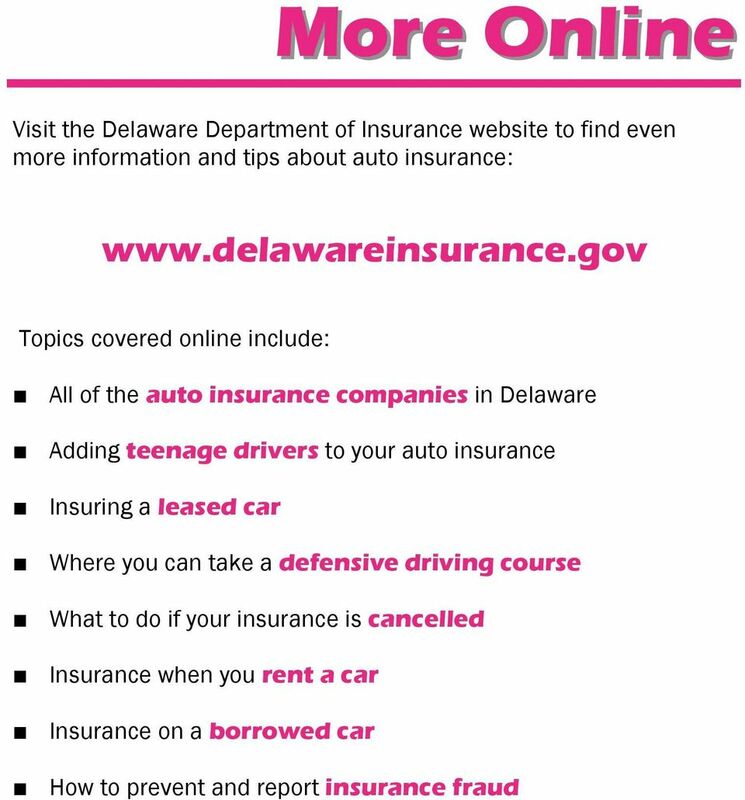 3 The Basics In Delaware, all drivers are required to carry three types of auto insurance: 1. Bodily Injury Protection - $15,000/$30,000 If you are responsible for the injury or death of another person and have minimum coverage, your insurance company will pay: Up to $15,000 to one person involved in a single accident Up to $30,000 to all people involved in a single accident, with no more than $15,000 to any one person 2. Property Damage - $10,000 If you are responsible for damages to another person s property and have minimum coverage, your insurance company will pay: Up to $10,000 to a person involved in a single accident 3. Personal Injury Protection (PIP) - $15,000/$30,000 Whether you are responsible for the accident or not, your insurance company will pay for the medical expenses and loss of wages for you and your passengers. 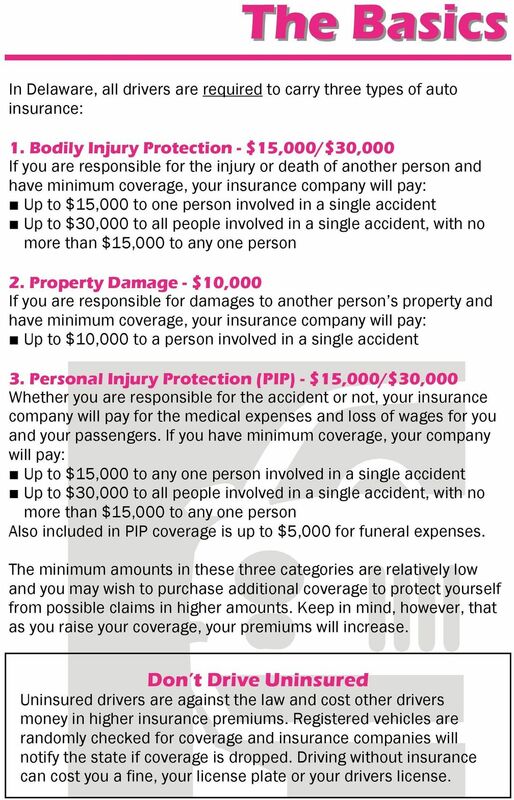 If you have minimum coverage, your company will pay: Up to $15,000 to any one person involved in a single accident Up to $30,000 to all people involved in a single accident, with no more than $15,000 to any one person Also included in PIP coverage is up to $5,000 for funeral expenses. The minimum amounts in these three categories are relatively low and you may wish to purchase additional coverage to protect yourself from possible claims in higher amounts. Keep in mind, however, that as you raise your coverage, your premiums will increase. Don t Drive Uninsured Uninsured drivers are against the law and cost other drivers money in higher insurance premiums. Registered vehicles are randomly checked for coverage and insurance companies will notify the state if coverage is dropped. Driving without insurance can cost you a fine, your license plate or your drivers license. 5 any money the company pays to you because of the other driver s negligence. You must have made a police report about the accident in order to make a claim under an uninsured motorist policy. Under-insured motorist coverage protects you if you are involved in an accident that is not your fault and the other driver does not have enough insurance to cover your loss. 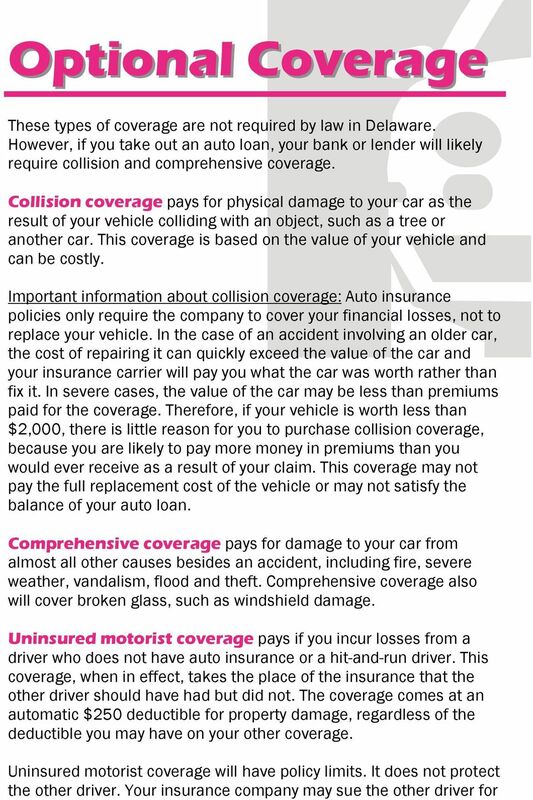 This coverage does not pay for damage to your vehicle. Towing and labor coverage pays the cost of towing your car to the repair shop subject to the limit of your policy. Premiums for this coverage are very inexpensive. However, if you are a member of an auto club, you probably already have this service. Rental reimbursement coverage usually pays the cost to rent a car after an accident, subject to the policy's terms. The premium will vary from insurer to insurer. 6 Rates Things that affect your auto insurance rates, some controllable and some not: Gender and age: Men have more accidents on the road than women; certain age groups tend to have more claims. Type of vehicle: Luxury and sports cars average a higher number of claims; also the more expensive a vehicle, the more expensive it is to insure. Driving record: Drivers with previous violations or accidents are considered to be a higher risk. Discounts: Auto insurers may offer premium discounts for numerous reasons, including for people who have taken an approved defensive driving course. Ask your agent what discounts are available to you. Amount of coverage: If you choose to carry coverage above the mandatory minimum, your premiums will be higher. 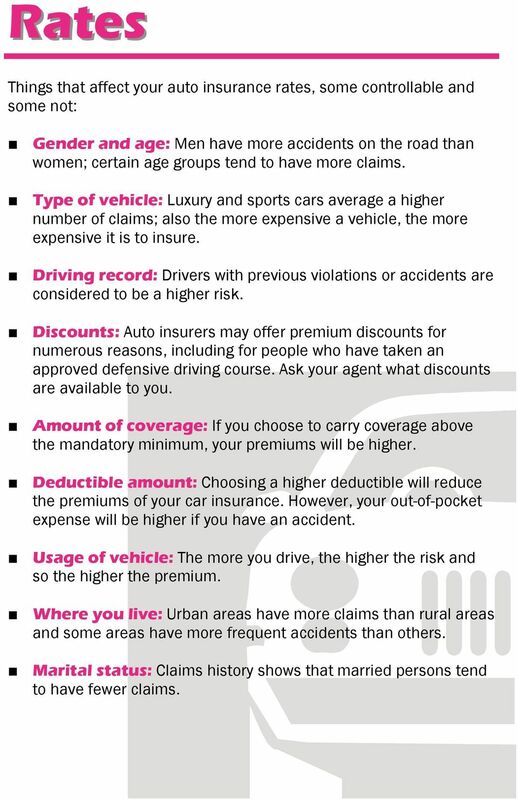 Deductible amount: Choosing a higher deductible will reduce the premiums of your car insurance. However, your out-of-pocket expense will be higher if you have an accident. Usage of vehicle: The more you drive, the higher the risk and so the higher the premium. Where you live: Urban areas have more claims than rural areas and some areas have more frequent accidents than others. Marital status: Claims history shows that married persons tend to have fewer claims. 8 Repairs After an accident, your vehicle may need to be repaired. 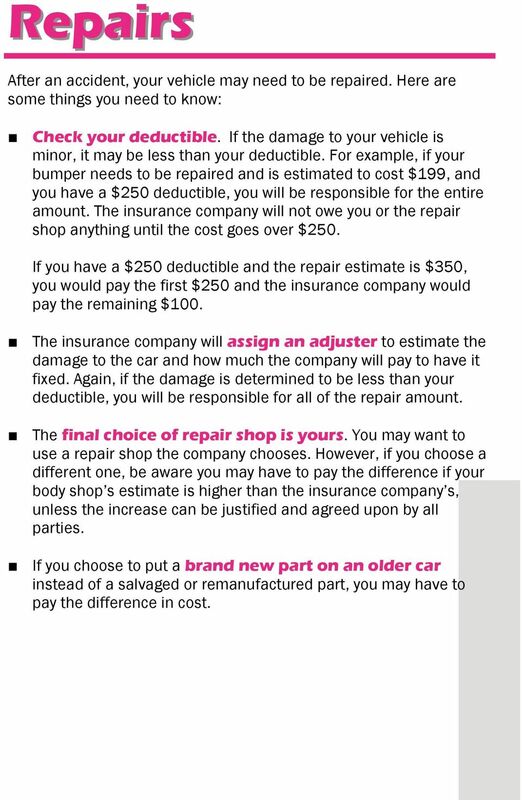 Here are some things you need to know: Check your deductible. If the damage to your vehicle is minor, it may be less than your deductible. For example, if your bumper needs to be repaired and is estimated to cost $199, and you have a $250 deductible, you will be responsible for the entire amount. The insurance company will not owe you or the repair shop anything until the cost goes over $250. If you have a $250 deductible and the repair estimate is $350, you would pay the first $250 and the insurance company would pay the remaining $100. The insurance company will assign an adjuster to estimate the damage to the car and how much the company will pay to have it fixed. Again, if the damage is determined to be less than your deductible, you will be responsible for all of the repair amount. The final choice of repair shop is yours. You may want to use a repair shop the company chooses. However, if you choose a different one, be aware you may have to pay the difference if your body shop s estimate is higher than the insurance company s, unless the increase can be justified and agreed upon by all parties. If you choose to put a brand new part on an older car instead of a salvaged or remanufactured part, you may have to pay the difference in cost. 9 Motorcycles A motorcycle owner and driver is required to carry the same minimum amounts of bodily injury protection, property damage and personal injury protection as any other vehicle (please see The Basics at the front of this guide for a description). But insurance companies often suggest different policies for motorcycles. Look for the following: When inquiring about a policy, an agent may give you a quote based on the minimum personal injury protection (PIP) limit of $15,000, but with a $15,000 deductible. That means, unless you deliberately choose otherwise and pay an additional premium, you will essentially have no PIP coverage, as the coverage limit of $15,000 will be reduced to zero by the deductible. Consider other options which come at a higher premium but with lower deductibles. A motorcycle insurance policy may provide only limited benefits. For example, a lower premium policy may provide medical and lost wage benefits for only those accidents which occur (a) on a highway and (b) when there is actual physical contact with another vehicle. To receive coverage for a greater range of potential accidents, you will likely have to pay higher premiums. 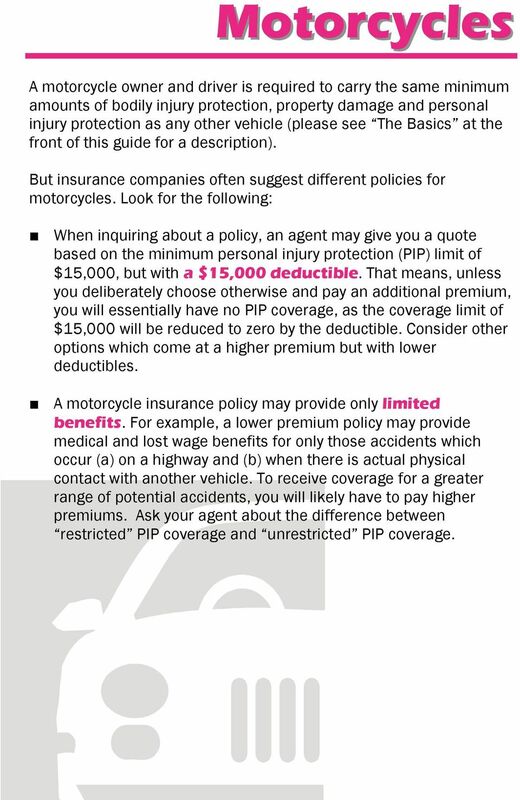 Ask your agent about the difference between restricted PIP coverage and unrestricted PIP coverage. 10 Need Help? The Delaware Insurance Commissioner s Office is here to help if you have questions about or problems with your insurance coverage or insurance company. Questions about insurance or complaints about an insurance company or insurance agent can be made to the Commissioner s Consumer Services division by phone, by fax, by letter, by or with an online complaint form: toll-free in Delaware or (302) (302) fax 841 Silver Lake Blvd. 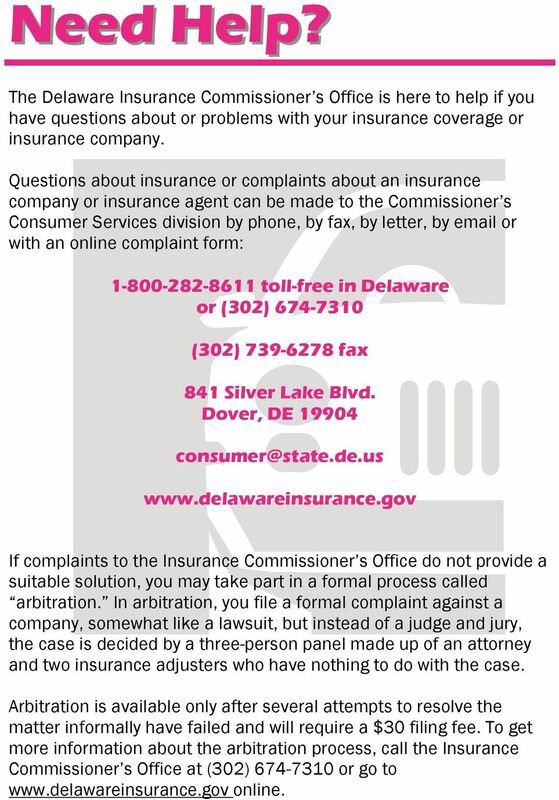 Dover, DE If complaints to the Insurance Commissioner s Office do not provide a suitable solution, you may take part in a formal process called arbitration. In arbitration, you file a formal complaint against a company, somewhat like a lawsuit, but instead of a judge and jury, the case is decided by a three-person panel made up of an attorney and two insurance adjusters who have nothing to do with the case. Arbitration is available only after several attempts to resolve the matter informally have failed and will require a $30 filing fee. To get more information about the arbitration process, call the Insurance Commissioner s Office at (302) or go to online. Auto Insurance. » Make sure you have sufficient liability insurance in the event that someone decides to sue you for everything and then some.